This Time Tomorrow: style challenge: spotted! Well in case you were wondering after yesterday's post, I have more polka dots for ya! Be sure to check out how the always lovely Rebecca, Meghan and Kellen sported their spots this week for our style challenge! Great look! Love polka dots! I can't get enough of your style, Krystal! so cute! the sun is shining perfectly for the photo! Ah, love that peplum top and those white jeans look so fresh! I like your peplum top a lot! i adore this outfit. simple and perfect. That dotted peplum top is absolutely darling! Looks great and super stylish! Stunning! And your hair looks fab, so chic! Polka dots AND peplum?! Love it! Such a cute outfit. peplum!! i've been looking for the perfect peplum top, but can never find one in my size in stock. I love this pairing, simple & sleek! What a great top! I love the combo of polka and peplum. Absolutely love the top, so chic! LOVE LOVE your peplum top, so pretty! Adore the peplum and the polka dots, definitely a perfect combination. love this outfit!! the top is amazing!!! Love the top, so cute! the first photo is amazing!!! love the peplum top and your hair!! I love the top! Two of my favorites, peplum and polka! Oh your peplum top looks amazing on you! And your new hairstyle is so cute! LOVE LOVE LOVE THIS!!!!!! 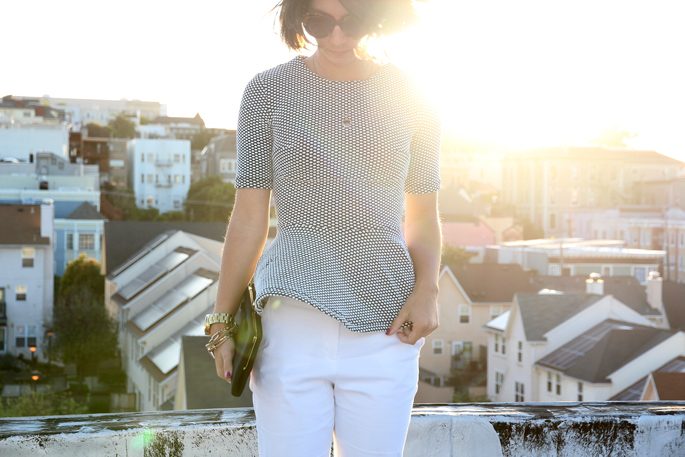 That peplum is perfect and those white pants are absolutely perfect on you. I like so much your look, in especial your shoes, are beautiful. Love the peplum top, is just gorgeous! this outfit is PERFECT. seriously, in every way! loving the polkadot peplum and white pants!! you look amazing all the time ! This outfit is soo cute! The white pants are lovely and the peplum top is a great pair to them! LOVE your cute haircut too! Would truly love it if you would stop by my new blog and tell me what you think... Thank you!!! Im not so into peplum for myself but after I'll rethink it because I love your top and how it looks on you! Love the outfit. I'd even pair that top with some colored jeans or capris.